This study, first published in German in 1975, addresses the need for a comprehensive account of Roman social history in a single volume. 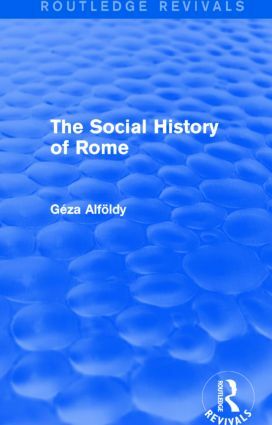 Specifically, Alföldy attempts to answer three questions: What is the meaning of Roman social history? What is entailed in Roman social history? How is it to be conceived as history? Alföldy’s approach brings social structure much closer to political development, following the changes in social institutions in parallel with the broader political milieu. He deals with specific problems in seven periods: Archaic Rome, the Republic down to the Second Punic War, the structural change of the second century BC, the end of the Republic, the Early Empire, the crisis of the third century AD and the Late Empire. Excellent bibliographical notes specify the most important works on each subject, making it useful to the graduate student and scholar as well as to the advanced and well-informed undergraduate.